This was indeed a weekend of discoveries, first the jackfruit/durian hybird and now this! While in Shanghai this summer I had a yum cha item that shot straight up to the top of my yum cha favorites list. I had never heard or seen of it elsewehere – until this weekend that is! My aunt and uncle have been helping me on my mission to collect restaurant menus. Not just any restaurant menus but REAL menus. As in the hard copy (hehe!) While flipping though a yum cha menu complete with pictures of each dish from a Sea Harbour Seafood Restaurant in Rosemead I saw a dish titled “Steamed Preserved Salty Egg Yolk Bun.” Hey! that’s the dish I’ve been hunting EVERYWHERE for! Holy Crap! 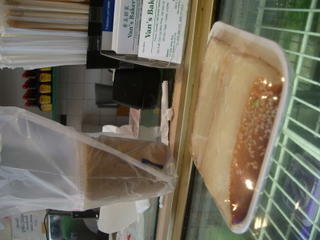 I completely freaked out and began gushing to my aunt of my long lost love for the Gum Sah Bao (gold sand bun). And guess what? It was a total concidence. My aunt and uncle had just eaten there the day before and got an extra order of the Baos to take home. It was still it the fridge. I swear, it was fate!!! 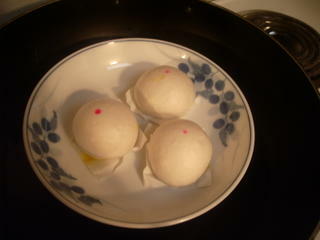 No more than five minutes later the Baos were out of the fridge and heating up in the steamer. It was my lucky day! 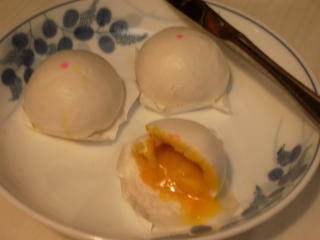 It looks a lot like the Nai Wong Bao (steamed egg custard bao). You probably couldn’t tell the difference unless you taste it. But this, oh man, it was magical. The salty preserved yolk (same one that goes into those beloved mooncakes!) melts into a burning hot liquid as the bun is cooked. You have to be very careful when eating them, but go ahead and burn yourself cause it’s no good when it’s cool. It’s a fantastic sensation, salty wet egg yolk enrobed with a creamy milk bun just thick enough to soak up some of the yolk but generous enough to allow you to even spoon some of the yolk out yourself. It’s amazing. I could eat a million of these. Screw the gook nai won baos (baked egg custard baos). We need more of these. It’s a fruit! Not just any fruit, but a hybrid breed of jackfruit and durian. I’ve never seen this in Hawaii before but apparently there’s an abundance in Vietnam. My aunt purchased it from the Hawaii Supermarket in Alhambra (I have no idea why it’s called the Hawaii Supermarket as they don’t have musubis or sweetbread). 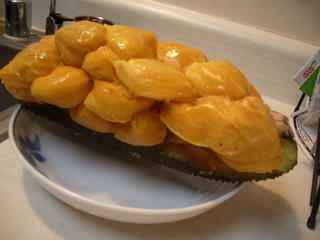 Mix the jackfruit and durian and what you get is a long rectangular fruit with an exterior similar to durian except harder and more prickly. 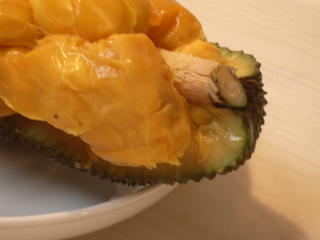 When you cut it open and eat the yellow part, you’re essentialy consuming jackfruit with the flavor of a durian. Very cool indeed! It’s definitely an interesting fruit, but for the most part I think I would prefer eating a normal durian or plain jackfruit. It’s funny because when you taste the flavor of durian you expect a soft creamy texture but what you get is sticky and chewy. It would be fun to have around at a party but for everday eating I’ll just stick to the normal stuff. Though you must admit, it’s a mighty interesting looking fruit! Happy Belated Moon Cake Day! My aunt and uncle live near LA and have been taking me out on weekends for wonderful food expeditions (basically I’m stuffing myself silly from Fri-Sun). 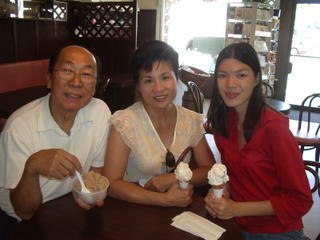 They live in Alhambra which is pretty much like one massive Chinatown.My aunt, uncle and I at Fosselmans (http://fosselmans.com/). We came here about three times in the past month. Of the flavors I’ve tried, the taro is definitely the best – a very earthy taro flavor and not too sweet, even a bit salty, it is very un-ice cream like and perhaps that is why I like it! 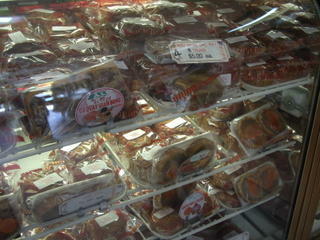 (odd things appeal to me).After a brief ice cream stop, we headed over to Van’s Bakery. 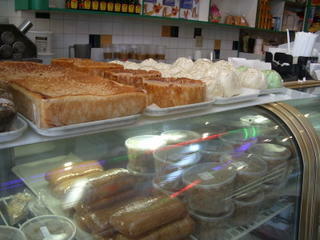 The bakery specializes in Vietnamese treats that are IMPOSSIBLE to find in Hawaii and even difficult in NYC. But today we were not interested in traditional Vietnamese treats. 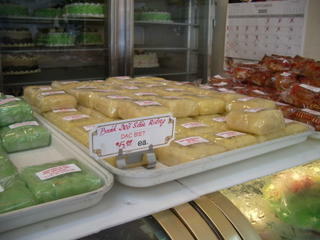 Oh no, we were here to MOONCAKE.The yellow on the right is a durian mooncake wrapped in yellow mung bean mochi. The green one has a traditional lotus and egg filling but is wrapped in green bean much. Pretty neato, eh? They are pretty expensive at $5 a piece, but I suppose those mooncaking companies only make their profit during this one season, so support the mooncakers! 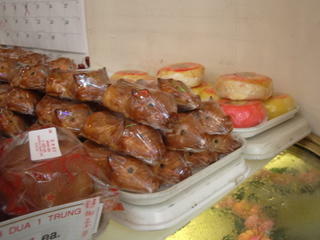 You’ll find a lot of animal shaped mooncakes in Saigon. 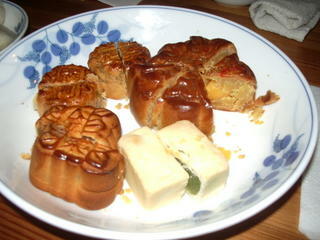 The mooncake is composed of only the cakey part and is usually given as gifts or treats to children. They don’t taste that great, so people usually display them until…they get moldy? Nonetheless, I wouldn’t mind having a mouse mooncake sitting on my desk. Isn’t it just crazy – all these variations of mooncakes?! Maybe during my midlife crisis (which I intend to encounter after I pass the CPA exam) I will open a mooncake shop. Crap, that will have to wait until after I graduate from the French Culinary Institute. There’s not enough time in the world! Just for this weekend, Van’s emptied out their regular display case of Vietnamese puddings, porridges and sweets and filled it with even more mooncakes! There was at least a dozen different varieties here. It’s kind of hard to see in the picture but at the front of the case they’ve cut each mooncake in half so you can see what the inside looks like. They’ve got pineapple, lotus seed, and even mango fillings. And then you must decide how many eggs you want inside: one, two, THREE? I always believe the more eggs the merrier (otherwise it gets to sweet without any saltiness to contrast the paste fillings). Sorry, I’m having issues rotating the picture, so you’ll have to forgive me. 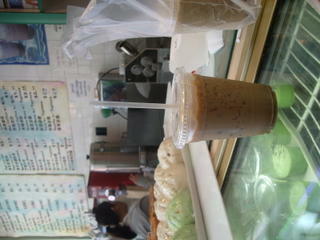 I’ve developed an addiction to caphe su da, the iced vietnamese coffee. It’s gotten to the point where I have to brew my own cup (as there are NO Vietnamese places here in Claremont!) Alhambra has more than it’s share of stores offering caphe su da, but Van’s and another nearby noodle shop make it the best. I noticed that on the west coast the coffee is much more stronger than back home in Hawaii or NYC. Perhaps it is becuase the Asian population here not just the majority but the ENTIRE population? I spotted this (right) just before leaving. It looks a hell of a lot like mochi, and since I haven’t had mochi in a long time, why the hell not? The picture on the right shows the entire cake. You can buy it by the piece ($1.50) or the cake (not sure on the price). It’s a lot like butter mochi except a lot lighter on the butter and heavier on the coconut. I think I could spend the entire day in this bakery and still be amazed by everything. We should all just move to Vietnam for the sole purpose of eating. After dinner at Mahan near Main St. we headed home to devour the mooncakes we had bought and recieved as gifts. Clockwise from the top: a the mini orginal mooncake with the lotus seed filling and one egg, a durian mooncake with two eggs, a melon paste filled mooncake wrapped in mung bean cake, a pinapple mooncake, another orginal mini. I enjoyed the durian one the most mainly becuase durian is my favorite fruit (for the moment) and it had two eggs! Durian and salty eggs, who would have thought it would make such a fantastic combination?And thus was the end of my mooncaking day. It was thoroughly exhausting in a very good way. Now I am back at school trying to explain the concept of a mooncake to my vegetarian/very health conscious roomate, I’m not quite sure if she understands. To make dough mix the flour with the salt and oil. Mix in the water slowly until the texture is smooth like pizza dough. Let the dough sit covered in plastic wrap for an hour. After letting it sit, pour a cup of oil into a frying pan and heat it up. Then divide the dough into 10 t0 12 balls, make them really smooth and round. Then take a ball and coat the entire ball of dough with some dry flour and roll it out with a rolling pin, until it is pretty thin but not delicately thin. Place the flatten dough into the pan with the oil and flip it over to the other side. (The dough may puff out at this point but that’s alright) Fry it until it is golden brown which shouldn’t take too long just a few seconds and then remove. Flatten another ball and place the next piece of flattened dough into the pan and repeat. If you want to make this into a sweet bread, as soon as you remove the puri from the oil, you can coat the poori with sugar, just sprinkle it on top and on both sides of the bread and eat it warm. Sift flour and salt together in a mixing bowl and work in just enough water to make a dough. Knead well, then cover with a damp cloth and let the dough rest for at least half an hour. When just about ready to eat, divide and knead the dough into 10 smooth, small balls. Take one ball, leaving the others covered, and knead again, then flatten it slightly between your hands. Brush each side with a little vegetable oil, and use a rolling pin to roll out t a thin disc (2 1/2 to 3 inches in diameter).Heat vegetable oil in a wok until very hot, and then cook the pooris one at a time over moderate heat. When the poori is put in to the hot oil it will float and you must keep pressing it down with a slotted spoon until it swells and puffs up. Then turn it over and do the same with the other side. The whole process only takes about 30 sec. Drain on kitchen paper and serve immediately. Makes 10. Boil the potatos and chop and dice into small pieces (peeled or unpeeled). Roast the flour in a pan and set it aside to let it cool. Put 1 tbsp of oil in a large pot and fry the mustard seeds and chillis, put the tumeric powder in them and add potatos and onions and some salt to taste. Add 1 cup of water and let it boil for 10 minutes, covered. Then mix the flour you roasted with 1/4 cup cup water and add this mixture into the curry. Cook for 10 minutes, uncovered until thick. Serve with poori.